A few years ago, I was involved in a travel company called World Ventures. (I'm sure at least one of the representatives got a hold of you if you are a traveler). Thought it was a great investment at the time and paid my fees. They tell you to go to training, so I shortly booked an upcoming training convention in Houston, Texas. It is where they play cool music, and prominent speakers give emotional speeches about the club; getting you excited to sell their product. To be honest, I was more excited about going to the NASA Space Center (such a kid). I'm no longer with the company anymore for various reasons in which I will document in a later post. But, my experience in Houston is well worth recording. For meals, I enjoyed a small breakfast from my hostel for free. Then budgeted to spend $10-$15 per day for other meals. It was an excellent cost effective trip. Landing in Houston was a bit intimidating. My last family trip to Texas, we flew into we flew into the massive Dallas/Forthworth Airport (DFW) where it was like a city, slicing through the traffic of people and shuttles coming from every direction. It was inundating. To my surprise, Houston's William P. Hobby Airport (HOU) was nothing like DFW. I followed the signs to my baggage with a breeze, then to the rental cars area, and headed out the doors hassle free. Immediately upon opening the doors outside the airport, I was welcomed by the stifling Houston heat and humidity! The shuttle to the Dollar Rental Car kiosk came soon after, and I happily hopped on to soak up some air conditioning. The line was annoyingly long for Dollar Rental. According to others standing in line with me, it is common for the HOU Dollar Rental Kiosk to have long lines and understaffed (so for future travelers, take heed)! Finally was given a compact car and headed straight to the NASA Space Center! Yes, I didn't waste any time! More to come on the space center in a later post. The drive to and from the space center was smooth and didn't run into any rush hour traffic. Actually, for the entire stay, the traffic wasn't as bad as I had heard. There were a few stops, but nothing long enough to become frustrated. 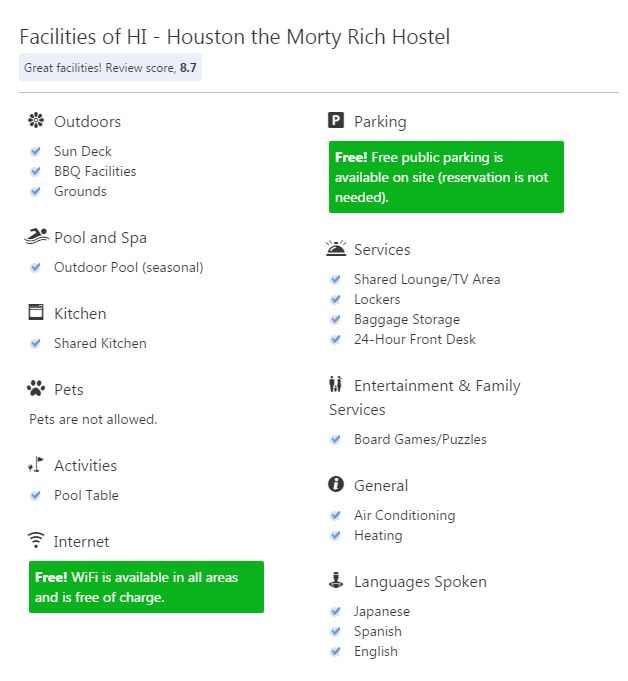 After stopping to get something to eat, I finally reached my hostel: HI - Houston at the Morty Rich Hostel. Hostel International (HI) has won third best large hostel chain for three consecutive years. Because I recently took a trip to Europe, I booked an 8-female dorm to keep cost low. Check-in was a breeze and was escorted upstairs to my room. There were a few ladies already there, and we greeted each other. The bathroom was inside the dormitory which was a plus since I didn't have to leave my room to take a shower! The room was also very clean. The downside was my upper bunk had no plug. So had to charge my phone at night across the room, and my alarm woke everyone up. Other than that, it was a pleasant stay. The first few days were full of training events for World Ventures. My hostel was only ten minutes away from the Hobby Center where the event took place. During my free time, I would slip downtown to explore the area and get a bite to eat. Thanks to my CityPass, I took several excursions that included the Houston Museum of Natural Sciences, Houston Museum of Fine Arts, Downtown Aquarium, and Kemah Boardwalk. The next day, I decided to explore the Houston Museum of Fine Arts after a WV event. It wasn't as exciting as the Museum of Natural Sciences. There was a photography exhibition that stood out among the rest. It was nice to see different photographers, different angles, different overall photography styles. It was very inspirational. There aren't photos in this museum, for I have this "thing" where I don't take pictures of someone else photography. I'd rather experience. One of my favorite restaurants close by was Bodegas Taco Shop. They are on 1200 Binz in a 14 story brown building. The patio is facing Caroline St in the Houston Museum District. You can select their menu options or make your own taco. My favorite was the Fish Tacos: they are delicious! Another site to see around the area is the McGovern Centennial Gardens; The park was beautiful with tons of flowers and a beautiful fountain. I sat on one of the benches to chill out and write. The atmosphere is very peaceful as well. The following day after an event, I made my way to the Houston Museum of Natural Sciences. To my surprise, and to my GPS's surprise, the is right around the corner from the Houston Museum of Fine Arts. So it was easy for me to park in the same spot as the previous day, and walk across the street. This museum is full of natural discoveries across the globe, including minerals, gemstones, dinosaur bones, and much more. Among my favorite exhibits were the Herzstein Foucault Pendulum, Hall of Ancient Egypt, Morian Hall of Paleontology (dinosaur bones), and Cullen Hall of Gems and Minerals. On the last event day, I visited the Downtown Aquarium just before the event. The only issue was parking! You know me, I love to save. But there was no curbside parking so had to park in the designated paid Aquarium parking lot. Having my ticket already from my City Pass, I was able to breeze past the line. There were so many children there, and I was among one of the children (haha). There weren't many things that excite me other than a few cool looking fish, and the ice cream. When I reached outside to enjoy my ice cream, I was greeted by some Latinos who danced to Latin music. I sat on the bench and watched until it was time for the event. The last day in Houston enjoyed another meal at the Bodegas Taco Shop. Then headed to McGovern Garden for some relaxation. It meant everything to me to reflect and "take it all in." This is something I tend to do at the end of every trip. There was one last activity to do on my City Pass, so I decided to make my way to the Kemah Boardwalk. The boardwalk is located about 45 minutes away from Houston, and 30 minutes from the Hobby Airport, which was perfect since my flight left that evening. The area around the boardwalk was beautiful with a lot of quaint shops and friendly people. Children were playing, and dogs were roaming enjoying the weather. I parked about 5 minutes away in front of a local restaurant. I wasn't as happy as the dogs in the heat, so immediately walked into a gift shop and bought a large beach hat to block out the sun. There were rides for children, restaurants, shops, a pier, boat rides, and nice scenery. I walked along the boardwalk most of the time. I stopped to get ice cream and a drink of water as well. It was a pleasant experience at the Kemah Boardwalk. All in all, Houston was amazing. With so much to do, great weather, friendly people; I'd visit again in a heartbeat. According to locals, there is much room for career advancement. Who knows what the future may hold! Safe travels. Where is the part about your exes?? Jk. Love the George Strait references. I lived in San Antonio for a while and spent a good chunk of time in Houston, but I still haven't been to NASA and I really want to! Love your pics! Lots of interesting stuff to do. Visiting the NASA Space Center would probably be at the top of my list. But the Museum of Fine Arts and the Museum of Natural Sciences also look like cool places to visit. Love reading your post and I also enjoy the pictures. What an exciting life. And the savings are even more amazing. Just curious how'd you get the travel voucher and other savings aside from the credit card rewards? Hello Ashanti, glad you enjoyed! I wrote another blog post about how I funded this trip that go into more detail. It is in the article, but you can find it here: https://ilovebellhop.com/how-i-uniquely-funded-my-houston-trip. Love the photos! Especially the ones from the NASA Space Centre! It looks like you had a fabulous time in Texas. I would love to visit Texas and Houston looks like a good place to start. The NASA Space Centre looks as though it has plenty of interesting things to do and see. I must put this on my travel wish list. I love science and history! Visiting NASA space center is a dream i am yet to fulfil (you're not alone as an adult, haha). Wow, I loved reading your post. I liked the space centre so much. Happy travelling! I have never been to Texas but hopefully will be heading there next year. Looks like there is so much to see and do in Houston! I think I would enjoy the NASA center and just strolling around the downtown to get the feel of the city. Thanks for sharing! I've only been in the Houston airport. Apparently, that needs to change. I didn't realize that there were so many tourist attractions in the area. I loved your post. When most Europeans think of visiting the US, most of us have NY, Florida or California in mind. 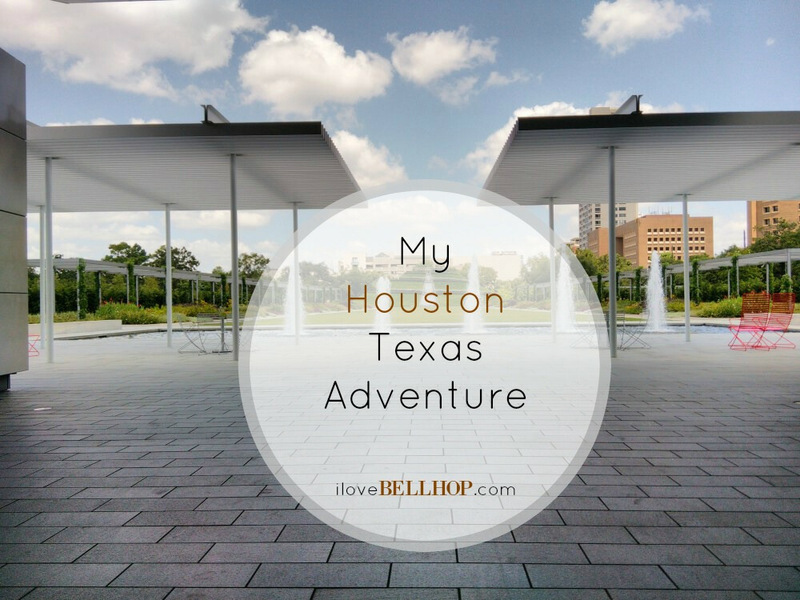 I had no idea Houston had some many cool places to visit!! That was an interesting read. Houston, Texas! I would love to go one day. Being so far south it may take me awhile to get there! I guess NASA is on most peoples bucket lists. It sounds like you had a great time. I've never had Houston on my list, but this may force me to change my mind. It really has a lot to offer, and sounds like a great experience.